I am in love with this cake. It’s so pretty and delicate and just downright gorgeous that I can’t imagine wanting to cut into it, no matter how delicious it is! 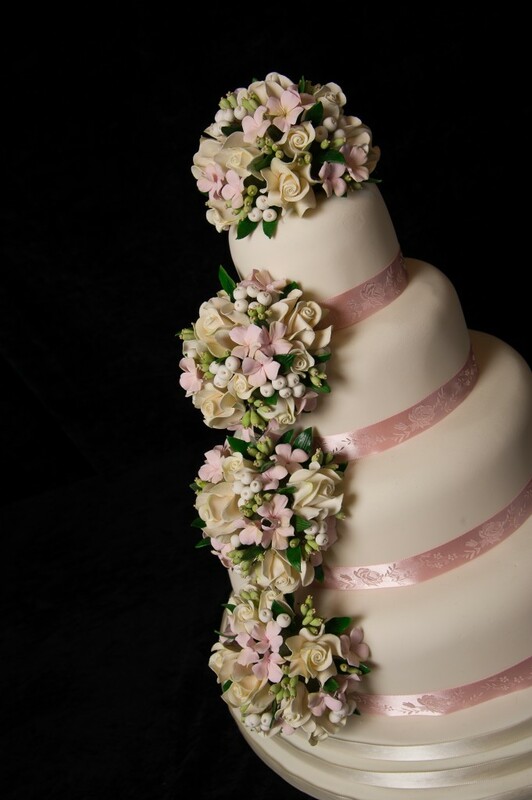 The four tier cake features elegant white icing and each tier is separated with pink ribbon. But what makes it a true show stopper are the balls of sugar flowers cascading down the side of the cake. Michael Hockley says the couple wanted to coordinate the cake with the color scheme of the wedding and so the bride’s bouquet served as the inspiration for the balls of flowers. How amazing would it be to have your bouquet replicated on your wedding cake? And not just once, but several times? I think this is a genius idea and it lends itself to creating a stunning centerpiece for your celebration. Many thanks again to Hockleys Cakes for giving us a chance to share their creations with you!